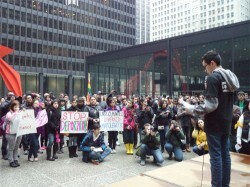 Dozens of undocumented immigrants and allies from across Chicagoland gathered on March 10th at Federal Plaza in the heart of the city to speak out about their experiences and push for a comprehensive immigration reform. As part of the National Coming Out of the Shadows month a series of events are planned around the nation. In Chicago, people from all backgrounds and races came together and marched from Union Park to the rally that was taking place in downtown. Estreberto Popoca came to the rally so “there are no more deportations and there is equal treatment for everyone who lives in this country. We are here with our children and we want an immigration reform that respects everyone,” said the 52-year-old man while holding a poster. Other parents, like Eliza Mateos support these activities because she believes “not only will I benefit if an immigration reform happens this year, but also my children because they depend on me,” said Mateos with her little son at her side. More importantly if this law becomes a reality “we would finally count in the United States” said the 36-year-old women. Jorge Mena, 25, is a member of the pro-immigrant group Immigrant Youth Justice League. He said that after the rally, their work will still consists of working at various high schools with the youth that feels lonely to show them that they are not by themselves in this situation. “Our parents don’t have to apologize for bringing us to this country when everyone around us is saying ‘well you guys are okay but your parents are the ones to blame’. We are tired of that and we are not going to let people blame our parents,” he said.